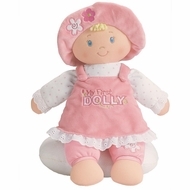 My First Dolly from Baby Gund is a pink baby safe doll for a young girl. This lovely doll from Baby Gund wears a pink dress with white lace frills over pink bottoms that are attached to the body. Embroidered on this pink doll's dress are the words My First DOLLY with flowers on her bonnet. My First Dolly has a small tuft of her blonde locks sticking out from her baby hat which is stitched to the doll's head and is baby safe. The doll's facial features are also stitched and the doll is machine washable.